©1996 by American Association of Sexuality Educators, Counselors, and Therapists and Sandra Cole, Ariadne Kane, Mary Frances Fairfax, Jane Fairfax, Jessica Xavier, Phyllis Frye, Jamison Green, Alison Laing, Angela Gardner, and Dallas Denny. Source: Kane, A., Roberts, J., Green, J., Denny, D., Laing, A., Frye, Phyllis, & Fairfax, J. (1996). The transgender alliance: A panel presentation. Presented at XXXVIII Annual Conference, American Association of Sexuality Educators, Counselors, and Therapists, St. Louis, MO, June – 12-16, 1996. The Transgender Alliance for Community was a multi-organization working group organized and maintained by the various national transgender organizations of the mid-1990s. Member groups included my American Educational Gender Information Service, The International Foundation for Gender Education, The Society for the Second Self, Renaissance Education Association, the International Conference on Transgender Law and Employment Policy, FTM International, It’s Time, America!, the Outreach Institute of Gender Studies, and GenderPAC. My apologies if I managed to omit anyone; it wasn’t intentional. The Alliance was active for several years. Its major activity was educating helping professionals. The Alliance gave presentations and set up tables in the vendor areas of a number of conferences, including the American Psychiatric Association, the National Association of Social Workers, and the American Association of Sexuality Educators, Counselors, and Therapists. The Alliance presented a united front to professional associations, but it had a practical purpose as well. Organizations with inadequate and even miniscule budgets were able to obtain representation without having to send staff. Boots were staffed by locals and the few national representatives who were able to fly in. AEGIS’ biggest contribution to the Transgender Alliance for Community was the loan of a large, lighted, and quite heavy conference display which was given to us by a supporter. I would mail it around the country whenever the Alliance had an activity, and it would duly be returned to us. 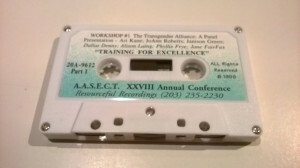 This week, while sorting materials belonging to Alison Laing (and destined for transgender historical archives across North America) I came across a videotape from a meeting of the American Association of Sexuality Educators, Counselors, and Therapists. I wasn’t present at the discussion and don’t remember getting a tape (if I did it’s now at the University of Michigan), so I digitized it. I discovered when I played it that there’s a tape two. I’ve not come across it among Alison’s audiotapes. Although I wasn’t in the room (for budgetary reasons) I was part of the planning team for the panel. Jessica Xavier filled in for me and did an admirable job. My name is on the tape and so I decided to post it. If anyone has the second tape, I’d love to borrow it to digitize it. The remainder of the presentation is on a second audiotape, which I don’t possess.